I do not claim to be a Biblical scholar, but I am fairly certain that Jesus didn’t invite the lost, the broken, the weary, and the stranger into concentration camps to help keep the nation of Israel racially pure. And when He said, “let the little children come unto me…” I know it was not to rip them from their parents and throw them into cages. The Predator-in-Chief, the Attorney General, and the majority of Republicans disagree. But, their understanding of faithfulness and discipleship is far different than mine. I am not sure what their religious beliefs are, or who they claim as their spiritual guide. What I am sure of is they have nothing in common with with the Christ of the Gospels. This entry was posted in Hunger & Poverty, News & Views, Quotes and tagged @nakedpastor, accursed ones, angels, asylum seekers, Attorney General, bible, Cages, child concentration camps, children, Christianity, devil, faithfulness, Gospel of St. Matthew, gospels, immigrants, Jesus, New Testament, parents, Predator-in-Chief, religious beliefs, Republican policy, separation, spirituality, Trump on June 19, 2018 by Ray Buchanan. The President of the United States has the right to fire any appointee he desires. That is his prerogative. What #BLOTUS does have the right to do, however, is to lie to the public about the reason for firing the Attorney General. The truth is clear, as are the facts. 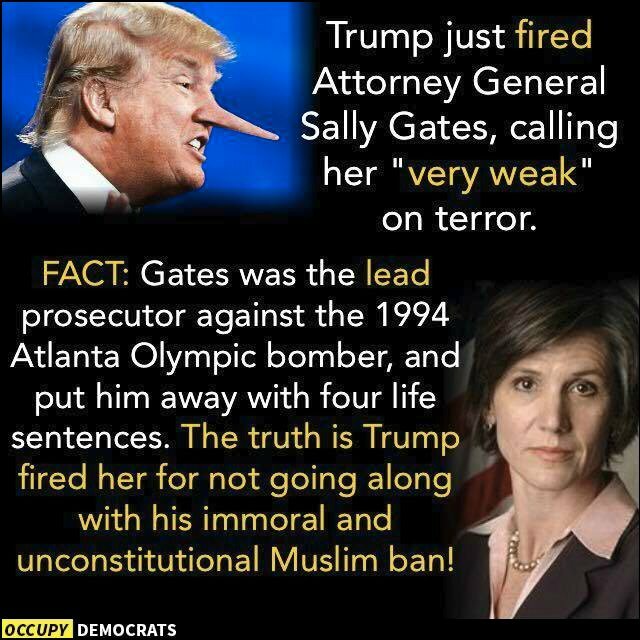 Sally Gates defied an immoral and illegal presidential order. #BLOTUS axed her for standing up against his Muslim ban. Good for her. She will not be the last victim of the vindictive and unstable person now consolidating his power of all of us. But she has demonstrated for the entire world the bullying tactics and the pathological lying for which Trump is so well known. Thank you, Sally Gates. Your courage to stand firm in the face of wrong is an inspiration to all of us. This entry was posted in Facts & Statistics, News & Views and tagged Atlanta Olympic bomber, Attorney General, BLOTUS, bullying, courage, facts, immorality, inspiration, lead prosecytor, lies, Muslim ban, pathological lying, power, Sally Gates, Trump, truth, unconstitutional, war on terror on February 3, 2017 by Ray Buchanan. 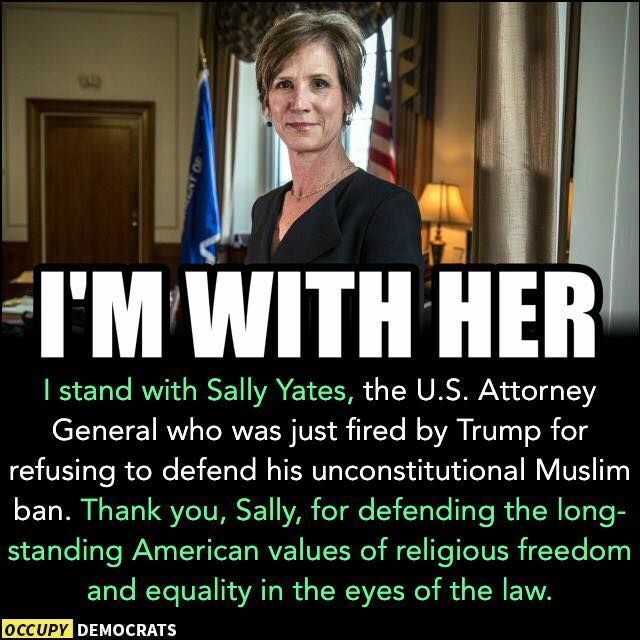 Thank you, Sally Yates for doing the right thing in the right way at the right time. All patriotic citizens of the United States owe you a debt of gratitude. You took immediate action to uphold the traditional values of the United States. Your action in defiance of #BLOTUS was a true demonstration of faithfully defending equality and freedom. I applaud your strength of character, and commend you for defending the Constitution. May we all be inspired by this courageous lady who has acted in the best tradition of our nation. And may we all follow her example in standing up against the unbridled bigotry and continuing attacks against our Constitution. United we stand. This entry was posted in News & Views, Quotes and tagged American values, Attorney General, bigotry, BLOTUS, character, constitution, courage, demonstration, equality, faithfulness, law, morality, Muslim ban, patriotism, religious freedom, righteousness, Sally Yates, united, United States on February 1, 2017 by Ray Buchanan.